The Platinum Pest Control Service Plan provides clients with a comprehensive inspection and a preventative service from a highly trained technician. Sovereign’s Platinum Pest Control Service Plan will protect your home from ants, carpenter ants, crickets, camel crickets, mole crickets, roaches, spiders, mice and rats, centipedes, millipedes, scorpions, silverfish, clover mites, and earwigs. If you have an infestation from a covered pest during the service plan period, a Sovereign Pest Control technician will treat the infestation at no additional charge to you. It also provides free annual termite inspections, convenient Exact Time appointments, and a true 100% Money Back Guarantee if residence is not kept substantially free from all covered pests. 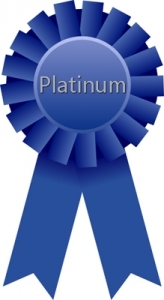 The Platinum Pest Control Service Plan is both highly effective and affordable. 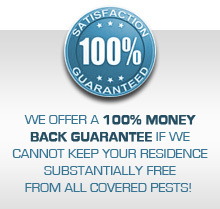 Not only does it provide discounts on all Sovereign Pest Control Specialty Services including: flea & tick, mosquitoes, outdoor party service, stink bug-box elder bugs, bee nest removal, fly prevention, pantry pests, and cicada killers but also provides huge discounts on any termite treatment for an active infestation. Be sure to check out our discounts on Specialty Service Options and Current Specials. Call us today at 866-430-9801 for a free quote!